We have your back even when your bank doesn’t. Avoid the strict requirements and long application process associated with traditional financing. We make getting equipment financing easy so you can spend your valuable time growing your business. 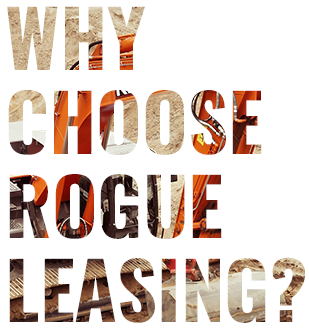 By working with Rogue, you can choose lease and financing terms that work best for your business. From monthly payments to the length of the contract, we will find the best terms that work for your specific needs. Companies often prefer to lease or finance equipment instead of purchasing it outright. By working with Rogue, you will preserve your working capital for operating your business and unexpected needs. Equipment leasing and financing will also enable you to budget more accurately by understanding your monthly payments. Choosing to lease your equipment allows you to preserve your available credit for operations and short-term financing. Equipment leasing and financing have enormous tax advantages. With leasing, in most cases 100% of the monthly payment can be deducted from your taxable income to reduce your tax obligations. Everyone’s situation is different, so please consult with your accountant.